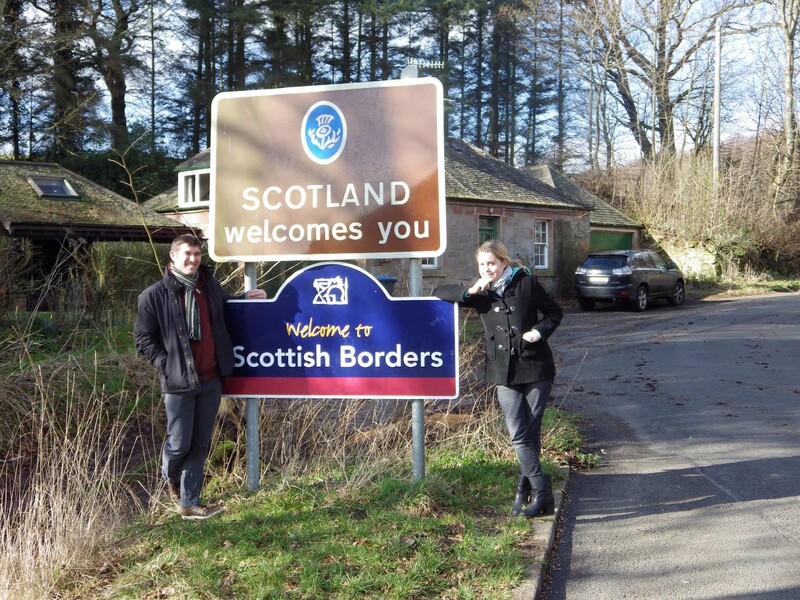 When our first visitors came to our new Northumbrian home, often their first request was to go to Scotland. Easy peasy – we are just a few miles from the Scottish border so it’s a quick drive up the A1 and there you are, in Scotland. 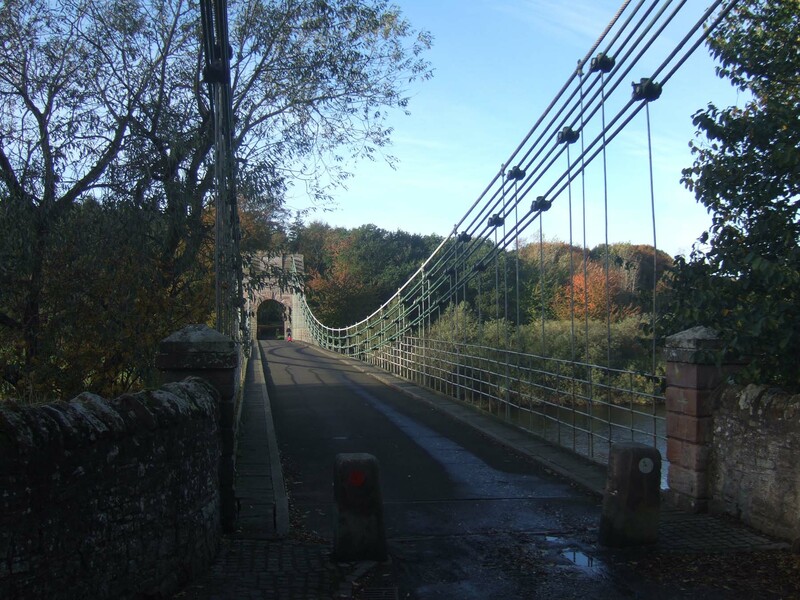 However, we soon discovered that it was much more fun to take people who wanted a quick trip over the Scottish Border to the Union Chain Bridge. Firstly, we go because it is just beautiful. 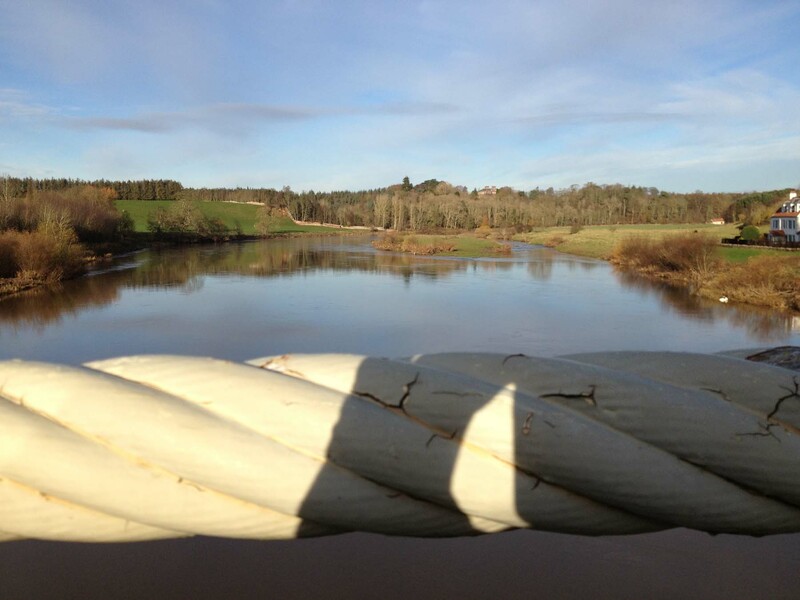 It sits over the Tweed, a magnificent and beautiful river, and you are particularly well placed to admire the river from the bridge. Secondly, we go because it makes us laugh. 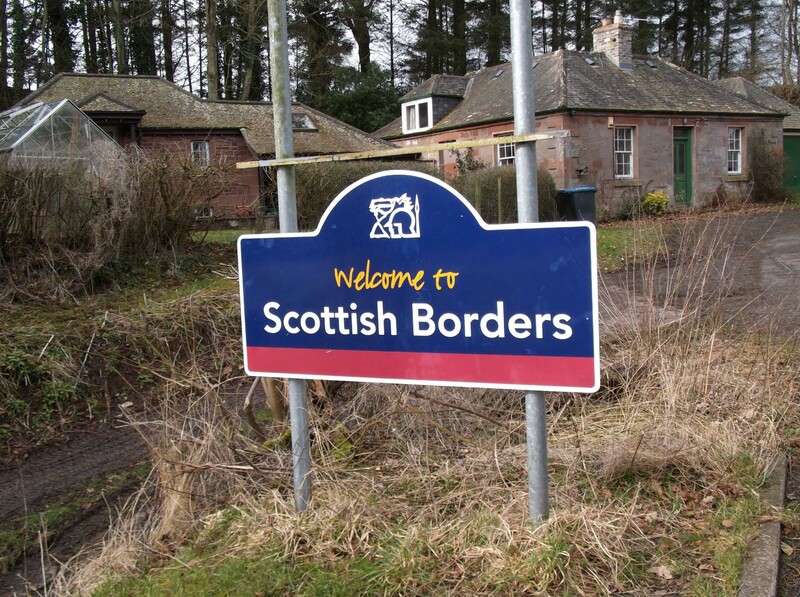 On each side of the bridge, the respective Scottish and Northumbrian councils have placed signs to ensure that you fully appreciate this is a border crossing and know which country you are in. 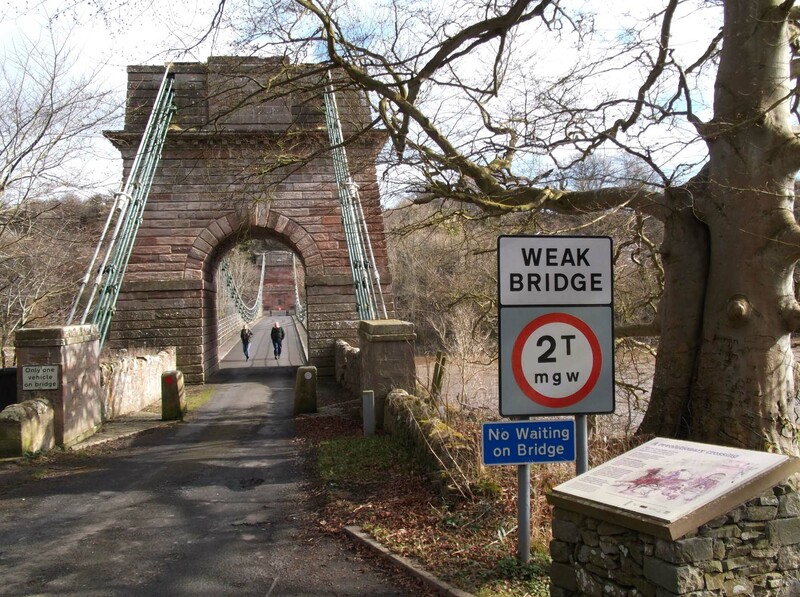 As you cross the bridge into England, there is a modest English sign. 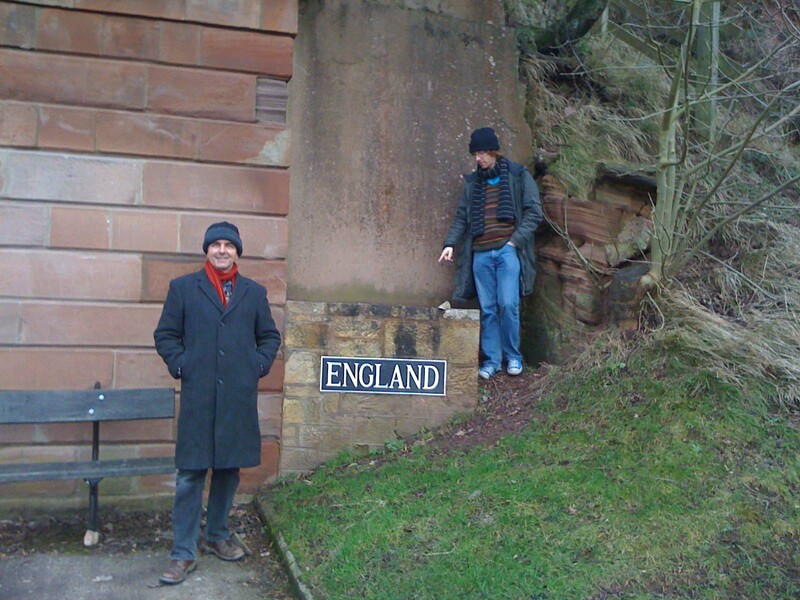 (Here James, our very first visitor in January 2011, helpfully points out the sign.) 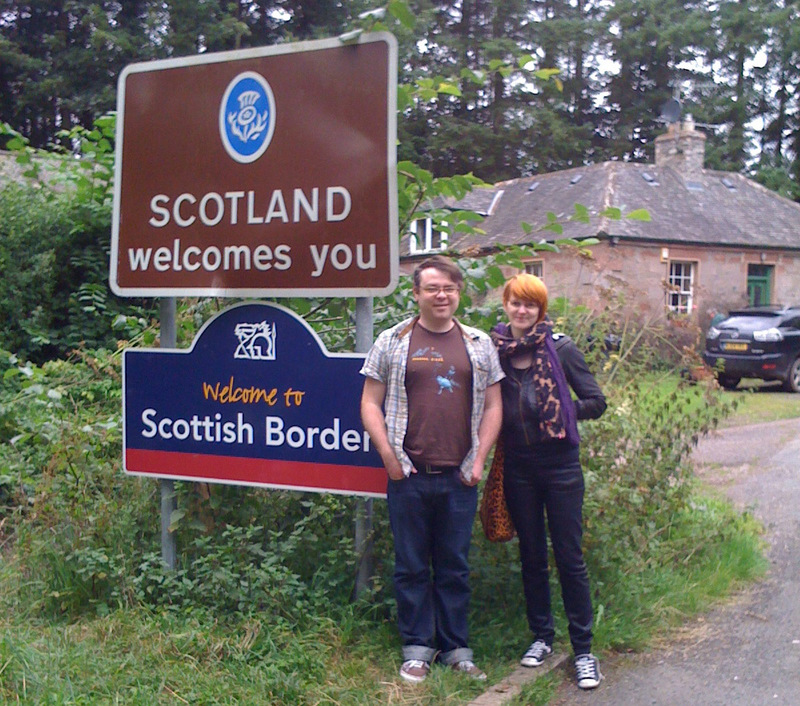 On the other side of the bridge, however, the Scots want to make sure you really appreciate that you’re in Scotland. 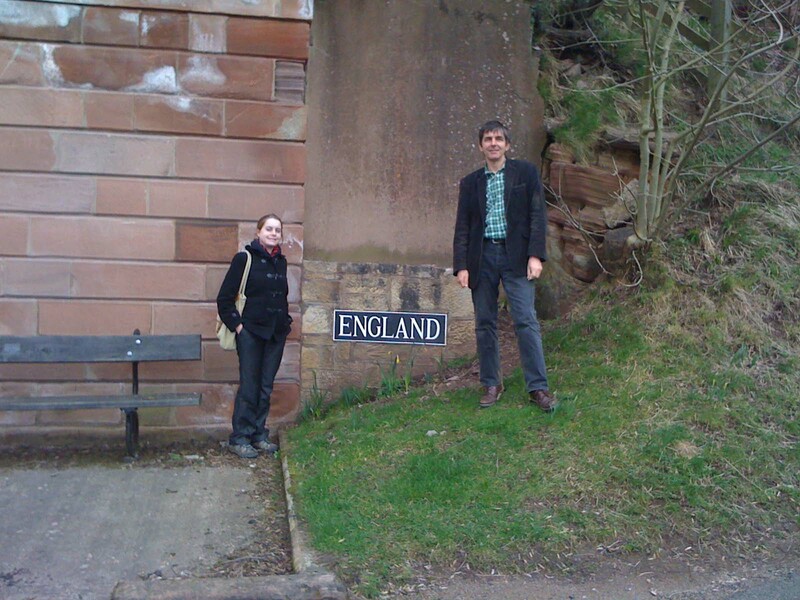 There’s a big, big sign – no two signs, actually, (as Ellie and Jak point out here on their May 2012 visit). And you’ll notice that the English, true to their proverbial reputation of reticence, make a simple statement of country. (Zacyntha’s first visit here, March 2011). 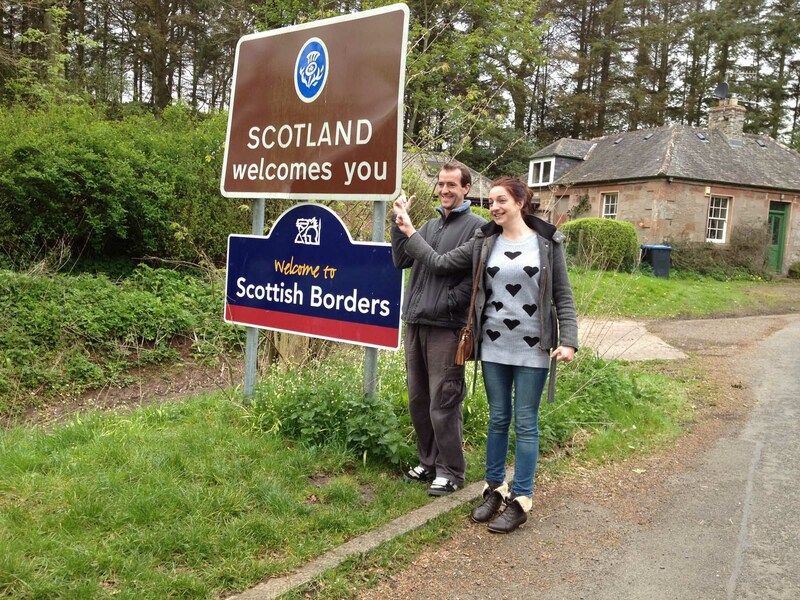 While the Scots come over all friendly and effusive and actually welcome you! (Ted and Helen’s visit, September 2011). Not any more, they don’t! Was it an irate English or Scots man that finally took matters into his own hands with this result?! Whatever, it is now a rite of passage for first visitors to our Northumbrian home that we take them to the Union Chain Bridge. But back to our topic. 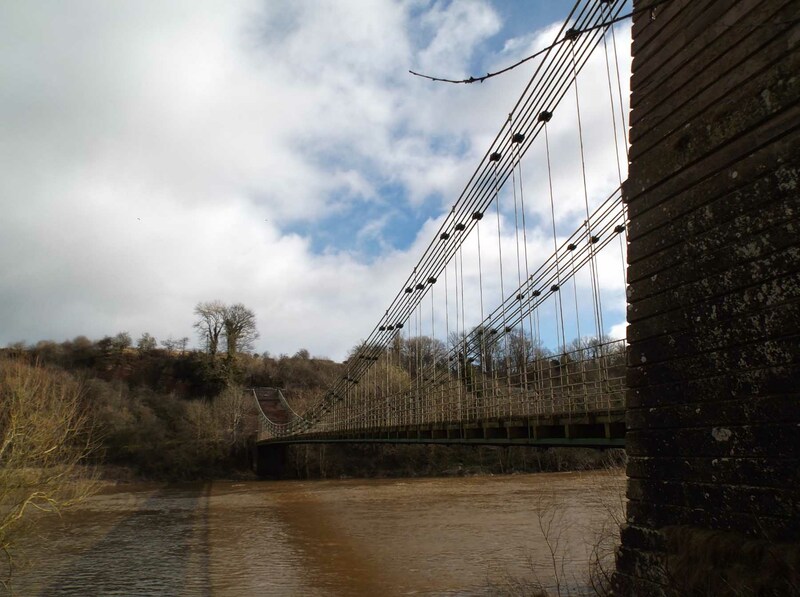 The third reason why we visit the Union Chain bridge is because it is a great bridge, a great engineering feat with a great history. It is the oldest surviving iron suspension bridge in Europe. It was built by Captain Samuel Brown RN in 1819-20. During his time in the navy, Brown was working on the development of wrought iron anchor chains. After he left the navy, he set up a manufactory in Millwall for the production of these chains. He was still developing his ideas, and in 1817 he filed a patent for the production of flexible chain links for suspension bridges. 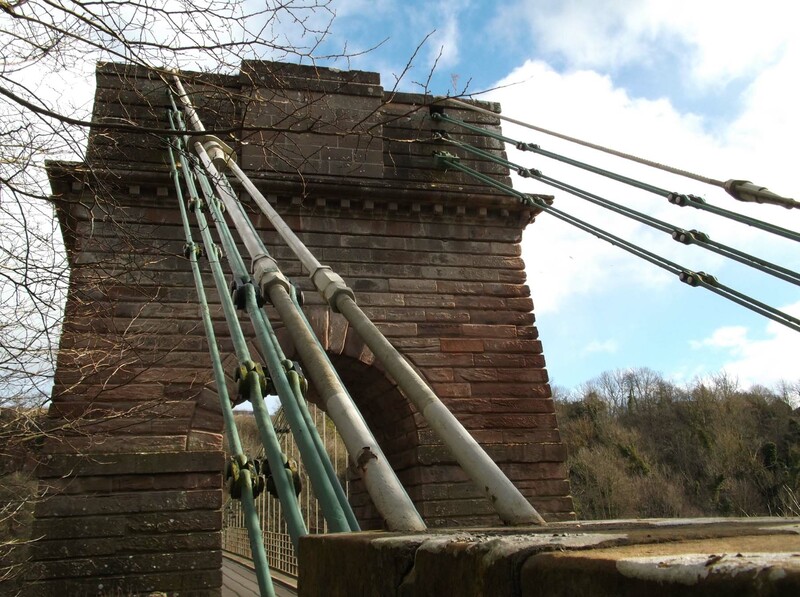 The opportunity to try out his new invention came when he was asked to build the Union Chain Bridge by the Berwick and North Durham Turnpike Trustees. (And, completely incidentally, in the famous photograph of Brunel, the great man is posing in front of chains produced by Brown’s later company, Brown Lenox & Co.). The flexible chain links are still evident now, but in very poor condition. 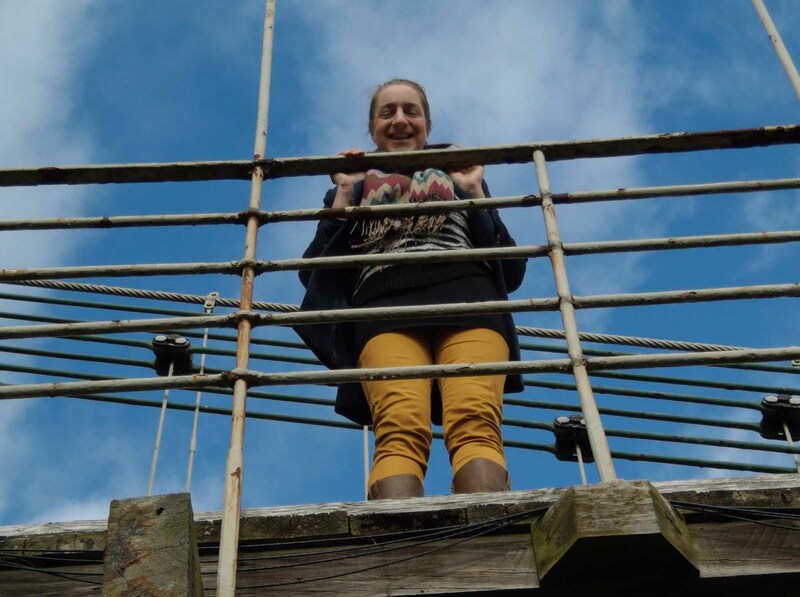 The bridge took less than a year to build so cost the Trustees only £7,700 – far far less in cost and far more quickly built than a traditional stone bridge. It attracted great interest, not least among fellow engineers. Robert Stevenson and John Rennie were here at its opening, and both Marc and Isambard Kingdom Brunel also came to see the bridge. A plaque on the English side, records Captain Brown’s name for posterity. It also records that additional strengthening work was done in 1902-3 with the addition of steel cables. You can see the newer grey cables strung over the original green bars here. 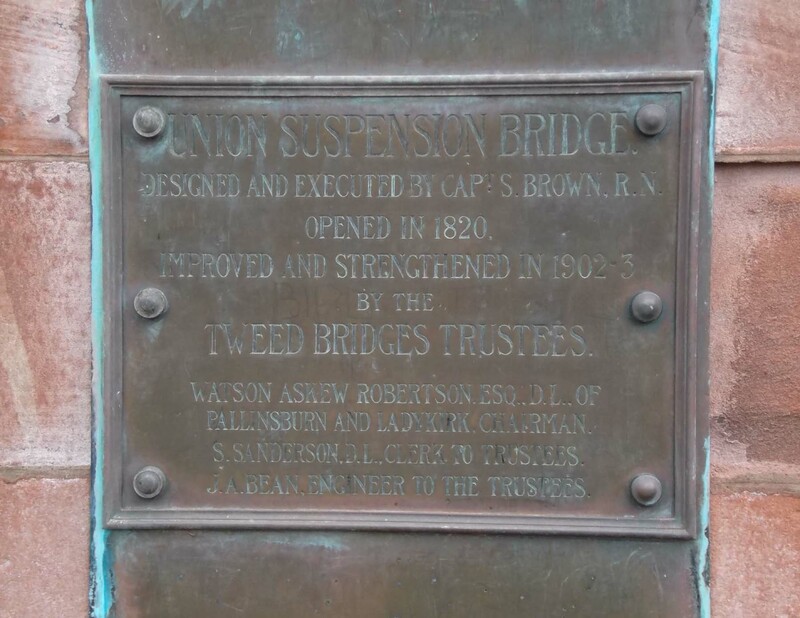 What the plaque does not record, is that the bridge was thoroughly overhauled and renovated again between 1974 and 1981 – defective chain links were replaced with spheroidal graphite cast iron links. Sadly, the bridge is once again urgently in need of repair. 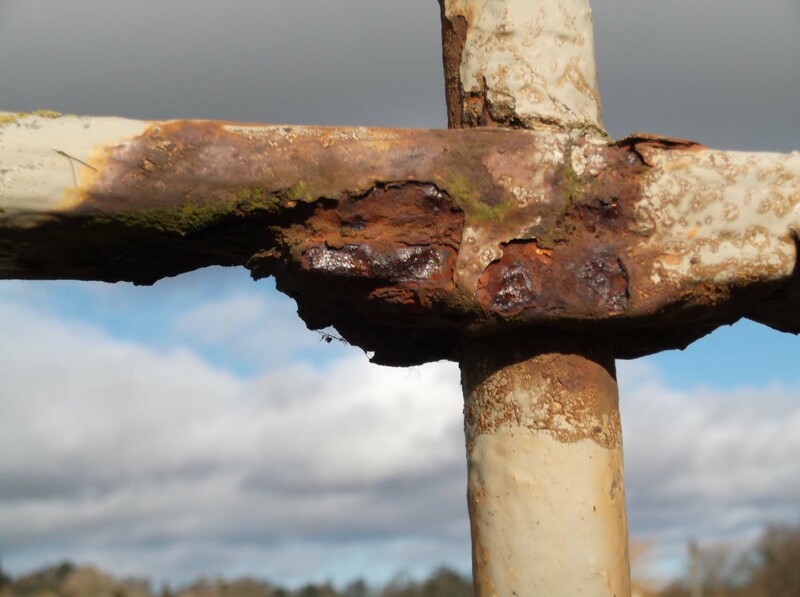 Everywhere you see the signs of decay, wear and tear. 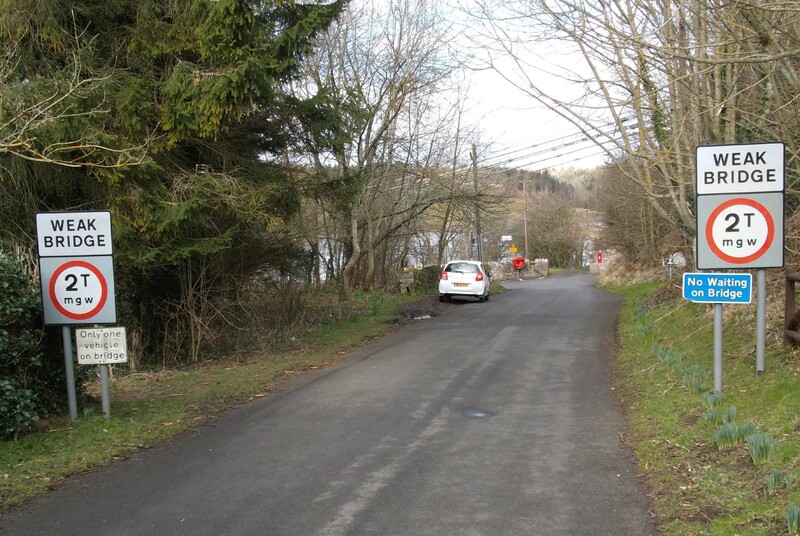 Indeed, the local councils are so concerned about safety that stringent warning signs lead up to the bridge. 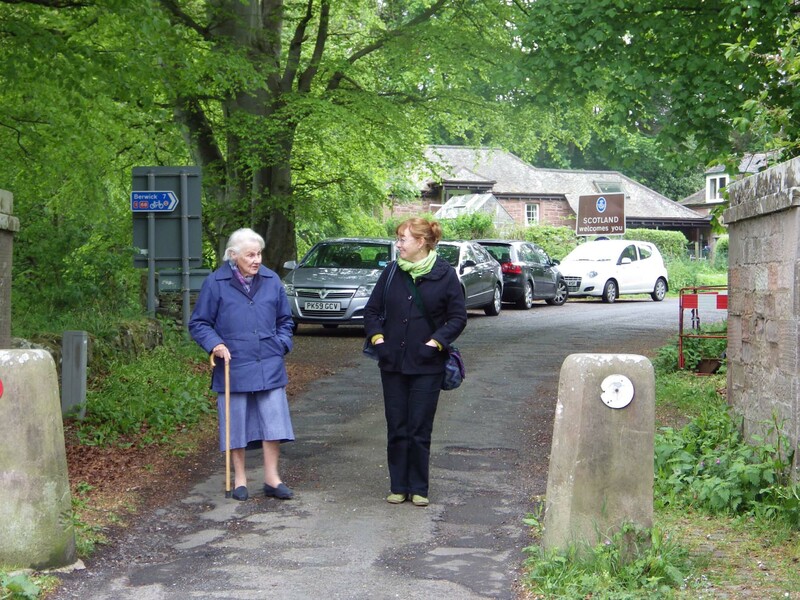 On the Scottish approach… And on the English approach … Over the last few years, there has been worrying talk of bridge closure. A horrifying thought for the locality! 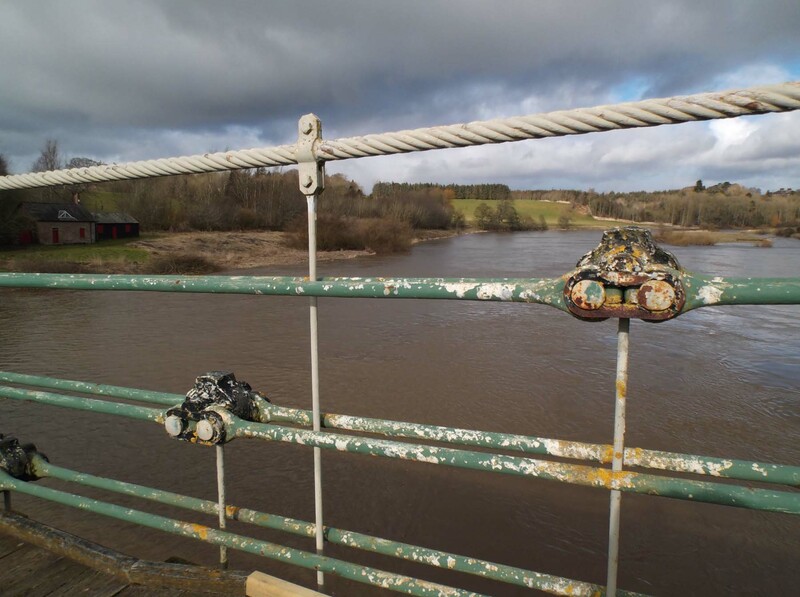 The bridge isn’t only essential for drivers and walkers crossing the Tweed, it also carries cables transporting electronic data. 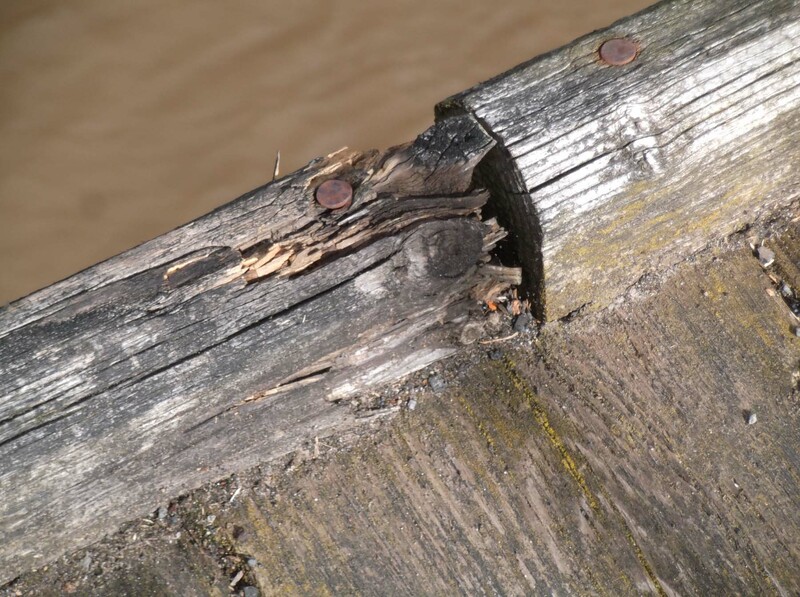 There were rumours of council bridge repair funds having been re-allocated into other budgets. 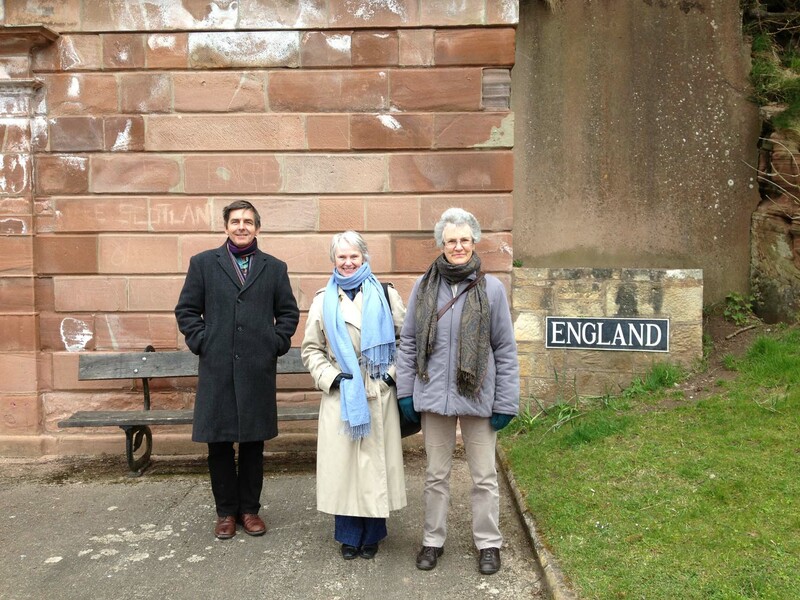 A friends’ pressure group was formed to push for repairs and proper appreciation of this fine bridge. Their sign has joined the others on the bridge approaches. (The friends have an excellent website with historic pictures and lots more information: http://www.unionbridgefriends.com ) The really good news – and extremely hot off the local press (just published in the February 19th edition of the Berwick Advertiser) – is that the Scottish Borders Council has now agreed to contribute £550,000 towards the restoration work, matching the funding already on offer from Northumberland County Council. 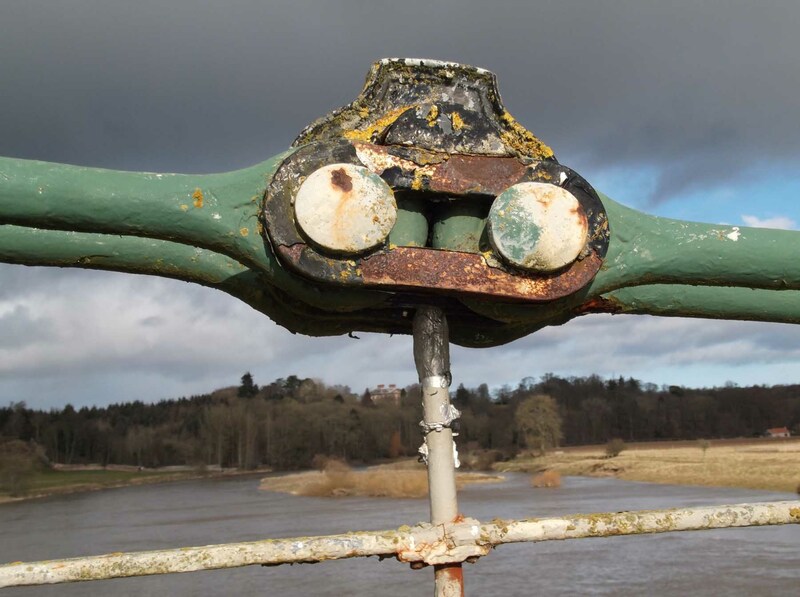 Now they can approach external funding sources, including the Heritage Lottery Fund, to secure the required balance of some £3 million (some say nearer £5 million). The bridge needs a new suspension hanger system and upgraded parapets. So – hopefully, it may indeed be fully repaired and in fine fettle to celebrate the 200th anniversary of its opening on 26th July 2020! There is yet another reason why we admire this bridge so much. 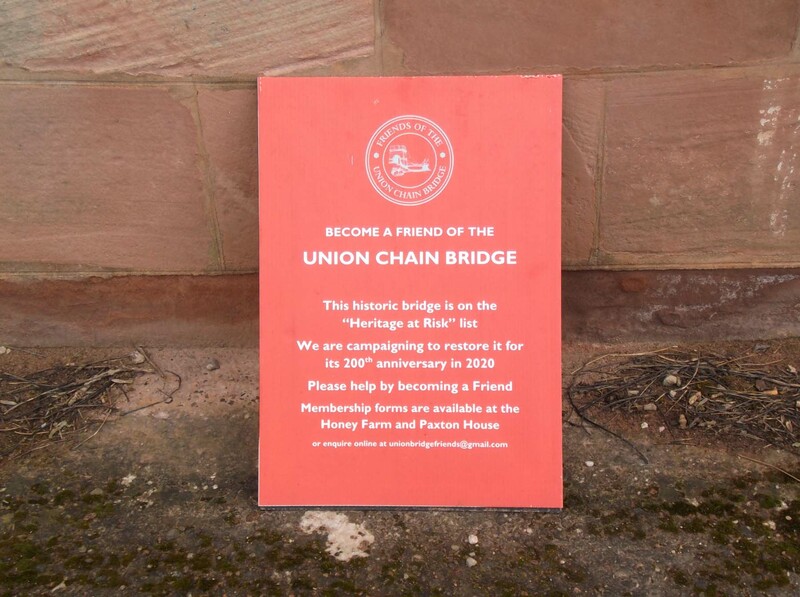 It is not called the Union Chain Bridge for nothing. 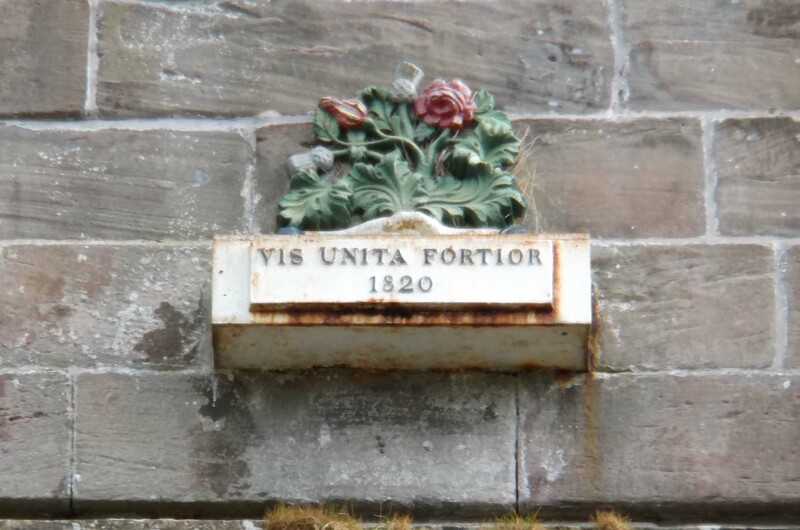 On each of the parapets, there is a motto: Vis Unita Fortior. Clumsily translated from the Latin, that reads: United strength is stronger. I now have to come over all political. Yes, I do believe united is stronger. The United Kingdom is the better for its unity. Europe too is stronger and better for the European Union. Many countries all over the world are better for the Commonwealth. We are all the better for the United Nations. No man is an island, entire of itself. Each is a piece of the continent, a part of the main. If a clod be washed away by the sea, Europe is the less. As well as if a promontory were. As well as if a manor of thine own or of thine friend’s were. Each man’s death diminishes me, for I am involved in mankind. Therefore, send not to know for whom the bell tolls, it tolls for thee. 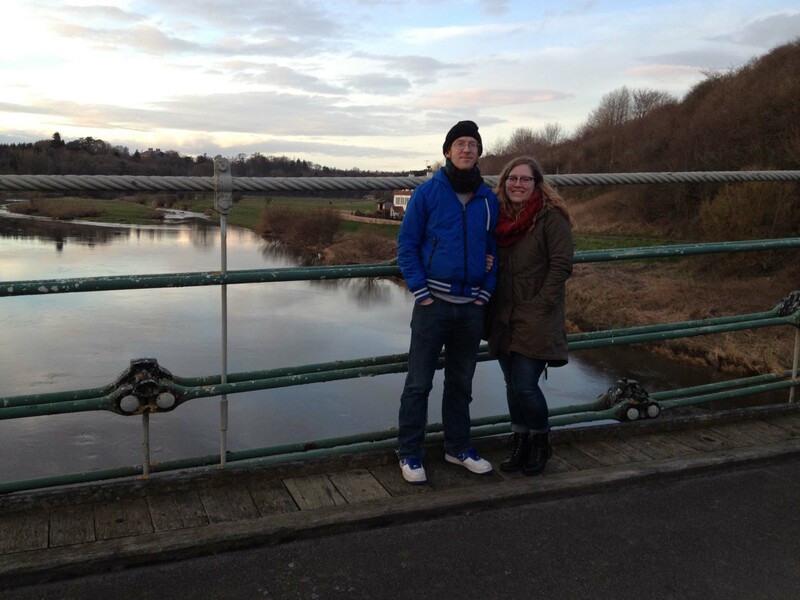 Thank you Ellie, for prompting this post on the lovely Union Chain Bridge! Lovely, I’ve not seen that bridge, maybe my friends the Felty Folk would like to visit? Glad you liked it! Felty Folk would definitely like this bridge! !